Old Oswestry Hillfort – plans, history and animation. A background to the excavation and a few notes about the text. Fig 01 – Old Oswestry Hillfort Excavation – Varley’s trenches. Old Oswestry hillfort has been subject to only one excavation. This was conducted by professor W. J. Varley in the years 1939 and 1940, under fairly trying circumstances. In addition to the numerous difficulties generated by the outbreak of World War II, the ramparts were still wooded, undergrowth was thick, and the underlying gravel layers misbehaved at the first hint of disturbance. The excavator managed to sink a total of seven trenches through the ramparts, but left the interior largely unexplored. It is not unscathed however, as the hillfort was found to be a suitable location to construct training trenches for WWI troops (hillforts have been reused for both the major wars of the first half of the 20th century – see Caburn and Brent Knoll for comparison). At some point after the outbreak of WWII however, it went under the plough which, arguably, would have been the more archaeologically destructive of the two events. Varley was wont to reinterpret his own findings over the course of his life, which is desirable, but never published them, which is not. Though details of his interpretations made their way into at least two publications – A. H. A. Hogg’s Hillforts of Britain (1975) and Forde-Johnston’s Hillforts of the Iron Age in England and Wales (1976) – the full report only saw the light of day in 1994, when Gwilym Hughes organised its posthumous publication in the journal of the Cambrian Archaeological Society under the title of Old Oswestry hillfort: excavations by W. J. Varley 1939–1940. The most recent significant study of Old Oswestry hillfort is the detailed earthwork survey and interpretation of the site produced by Nicky Smith on behalf of English Heritage. Given the conditions of the original excavation, the unusually lengthy gestation period before the publication of the original report, and the lack of any subsequent excavations at the site, there is still some confusion about the chronology of construction work. Hogg’s concise summing up of Varley’s findings is used as a foundation for the following description, with Nicky Smith’s invaluable work providing welcome paths through much of the remaining confusion. This is, none-the-less, the simple version of events. But before we start, I ought to point out that ‘Period 1’ always refers to the earliest construction phase of the hillfort, as opposed to the earliest occupation of the hilltop. Varley considered this to have occurred in the Late Bronze Age, and consisted of a number of wooden roundhouses, enclosed within a timber palisade. This proposed origin is consistent with a number of other hillforts belonging to the Early Iron Age. He also identified later, stone built structures which he considered contemporary with the earliest rampart construction phase. This consisted of the construction of two ramparts. The innermost – a stone revetted box rampart – was around 3.5 metres across, and enclosed an area of 5.3 hectares. Around 5 metres in front of this was a ditch of around half a metre in depth, with a ‘V’ shaped profile, and along the outer rim of this ditch, the second rampart was constructed using substantial boulders for core material. This was then covered in a layer of gravel, before being capped with clay. This rampart also seems to have had an accompanying outer ditch, but unfortunately the geology was such that Varley was unable to establish a profile for it. 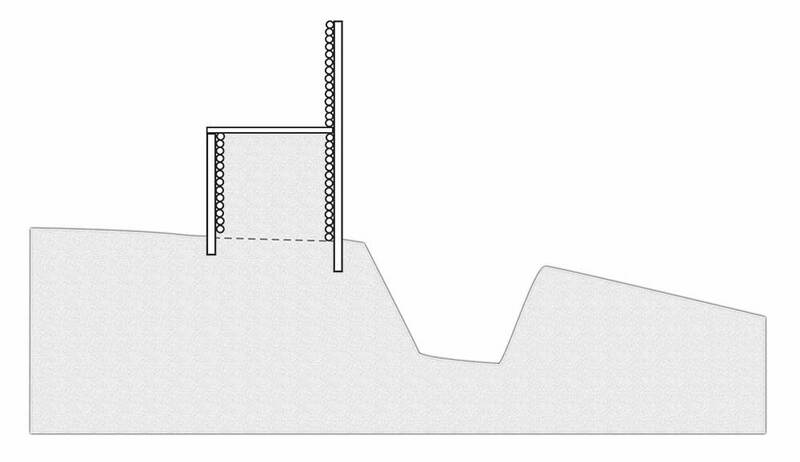 Example of a box rampart – based on Ivinghoe (after Dyer). At this juncture the entrances were inturned and revetted with stone, the innermost bank was enlarged, and two additional banks and ditches were constructed, encompassing the Period 1 defences, and making four in all. The majority of the Period 2 ramparts were concealed by the final construction phase, and Varley’s excavations were far from exhaustive, which is why they are not represented here. Image 01 – Old Oswestry Hillfort Period 1. Image 02 – Old Oswestry Hillfort Period 2. There is some debate as to whether periods 3 and 4 should be viewed as two parts of the same phase rather than being viewed as a separate events, but for the sake of clarity, and in lieu of any future excavations, we’ll stick with the current system so as not to complicate matters. At this point in the evolution of Old Oswestry hillfort, two large outer banks were added, partially obscuring earlier works. These were constructed by using the plentiful supply of boulders at the site by heaping them up into a hollow wall, and using layers of gravel and clay as fill. These final defences encircled the entire hill, and, it seems, were concurrent with the eye catching hollows of the western entrance appearing. Image 03 – Old Oswestry Hillfort Period 3. Image 04 – Old Oswestry Hillfort Period 4. 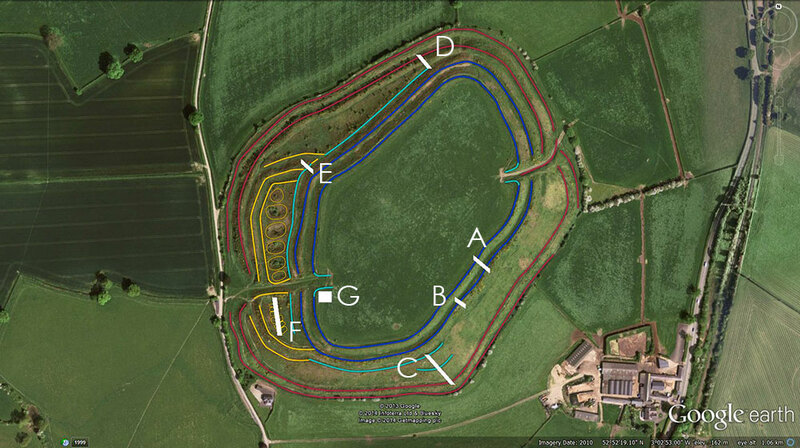 Image 05 – Old Oswestry Rampart sequence – colour coded to match GE images.After Forde-Johnston. Visually the hollows either side of the entrance are arresting, and certainly unique. The hollows on the northern (left as you go in) are much larger than the ones on the right, which are more like scoops in comparison. The hollows do not have entrances, which somewhat curtails their usefulness as stock enclosures, and suggestions that they were cisterns are even less convincing – they are not flat bottomed, and more to the point, they are not convenient when compared with a simple pond arrangement within the ramparts. Evidence from other developed hillforts suggests that under siege, even the most elaborate entrances were not safe from fire (see Danebury Ring). Sieges were most likely short lived as very few hillforts had internal water supplies in the form of springs. If the attackers cut off supply lines, it could be reduced to a shortish waiting game, so to have a large water reserve on the outside of the gate is somewhat counter productive. Another reason, or possibility, that the function of the hollows is so elusive is that we may be looking at something unfinished. If you remove the banks from the hollows, you will have an impressive but far from unique forecourt (see Danebury Ring, Badbury Rings, Castle Dore, Helsbury Castle ). This of course raises the question of why it was unfinished, and why the soil was mined out in pits, rather than quarried. Another possibility is that they were a good source of the clay, boulders, and gravel that was needed for the outer rampart banks, and they just took all that was needed. There is still something missing from the picture, but let’s not say ‘ritual’ just yet. Wat’s Dyke – a 40 mile defensive bank thought to have been constructed in the 8th century – butts up against the north and south extremities of Old Oswestry hillfort, incorporating the ancient defences. WWI – many practise trenches were sunk in the interior of the hillfort, to train soldiers in trench warfare (in all probably including the WWI poet Wilfred Owen, who was billeted nearby). Liberal use of explosives in this period has somewhat altered the archaeology. Old Oswestry hillfort is in the news at the moment because of a proposed building development which would be situated very close to the hillfort. Though parts of it would be built on land which has already been developed at one point or another, green fields have been selected for others. This proposal is being strongly contested by local and national groups – headlines, websites and a link to the petition objecting to the development can be found below. Cunliffe, Barry (2005). Iron Age Communities in Britain (4th Ed). Abingdon, Oxon: Routledge. Smith, Nicky (2012). Old Oswestry, Selattyn and Gobowen, Shropshire: Analysis of Earthworks ; Report. English Heritage. Please note typo – it’s Gwilym Hughes. . Thank you Heather – corrected. This is interesting stuff! Have you looked at LiDAR data as a tool? The Environment Agency now provide access via 3w.geomantics-group.co.uk. This data is available at a cost but the website suggests 100% discount to researchers. My area of interest is North Yorkshire which is an area rather lacking in hillforts but hope you get round to it in due course. I’d certainly like to do more in the future – thanks for suggesting it. Re. last comment should be geomatics, website does say 100% off for non commercial users.